A two week intensive letterpress printing workshop in Turin, Italy. Hosted by Archivio Tipografico, in collaboration with Swayspace. A step–by–step introduction to the basic fundamentals of setting type and letterpress printing. Designing, setting type, and printing personal stationery, broadsides, posters, or business cards with handset type and polymer plates. Module A is recommended for participants with little or no experience. Experienced printers are also encouraged to attend. Space is limited to 10 participants. Work with our designers, illustrators, and printers to develop and produce personal projects. Proofing typographic comparisons, making plates or linocuts, producing an edition of original work. Module B is recommended for participants who have completed Module A or have experience as printers, artists, or designers. Space is limited to 10 participants. 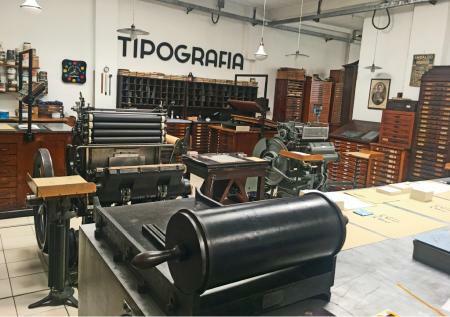 Archivio Tipografico is an active and collaborative space for the preservation, the study and the practice of typographic arts. The aim of AT is to preserve, to keep alive and to reinvent in a contemporary way the craft of composing movable type and producing high quality letterpress prints. The aim of this workshop is to extend the reach of AT’s mission to a group of artists, designers, and artisans from different places and with different backgrounds, and to build or supplement the printing practices of the participants such that they continue printing.